First, a bit of background. A few weeks ago, I was walking near Thumb Plaza, when I made an amazing discovery. A new restaurant had opened. Even better, the restaurant’s advertised crayfish. I am a HUGE seafood junkie; I HAD to try it out. Unfortunately, we just didn’t have the time…. until yesterday. The atmosphere was definitely a shocker. I knew this was not a typical crayfish restaurant the moment I walked in. First, the interior decor was elegant chic, almost fancy. 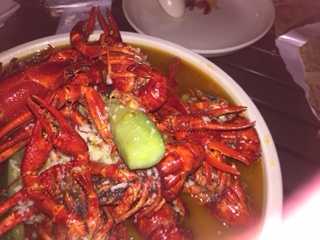 In China, at least, good crayfish is almost exclusive to hole in the wall night stalls. More alarmingly, it was quiet. However, the lack of people did allow us to score seats on the outside balcony. Best feeling ever. I must say, the menu was underwhelming, initially. There was relatively little variety and the items were pretty expensive. However, what they lacked in variety, they made up in flavor. Rice in crayfish broth- Guess what? The restaurant doesn’t serve rice. Of course, who needs boring white rice when you can have it cooked in a rich flavorful broth. This dish was DELICIOUS!!! 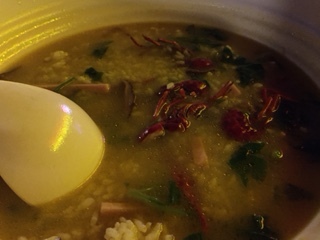 The broth was uber- unami, without the MSG aftertaste; the rice was not too sticky and it was not greasy. Even my dad, who doesn’t like seafood, loved it. Spicy (Chinese style) marinated cuttlefish- My dad was struggling to look for something on the menu. 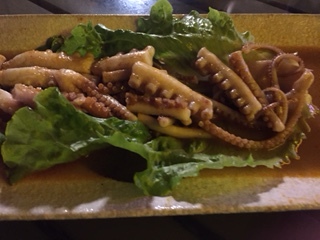 He settled on spicy, marinated cuttlefish. Spicy? Marinated? Cuttlefish? Sounded good to me. It was great. The cuttlefish was unbelievably tender and absorbed all the flavor. If cuttlefish isn’t your thing, they have a rather wide variety of other marinated seafoods. Kebabs- I was shocked by these. 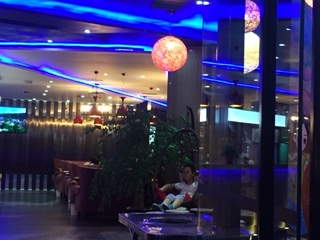 Normally, Chinese restaurants that serve good meat are a bit deficient in the seafood department and vice versa. Thus, when the waiter recommended the grilled lamb, I was shocked and a bit suspicious. We didn’t really have a choice on this one anyways; crayfish wasn’t going to cut it for a meal. Rather reluctantly, I ordered two grilled sauries and my dad got 4 lamb kebabs. The waiter was right; they were amazing. I will even go as far as to say that the saury tasted better than the ones from the Japanese restaurant downstairs. Crayfish- I saved the best for last. 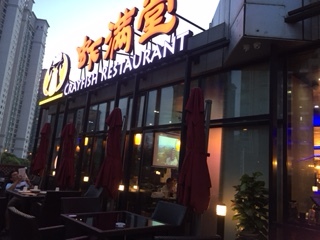 The restaurant’s name is Crayfish Restaurant. Thus, it was pretty obvious what we had to order. The decision wasn’t as simple as ticking off a box though. The restaurant had 8 different varieties, in 3 different sizes. In the end, we decided on the garlic flavor. Definitely worth the price. The crayfish was fresh and sweet, which matched perfectly with the savory richness of the sauce. Eating crayfish is a messy and hot affair, but don’t worry, the restaurant provides bibs and gloves. Tip: Do NOT discard the head. There is a reason why it is disproportionally large. It’s the juicest, most succulent part. Crayfish Restaurant is a great restaurant. Although it is a bit overpriced, the food makes it up a great deal. I will be returning soon. That’s it for now. Have a great week!!! !